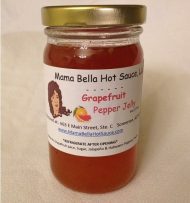 Mango Habanero Pepper Jelly. Great heat without overpowering the delicious mango flavor. Just the right heat to add to your wings or anything you are grilling. Of course, great for breakfast on bagels/English muffins & cream cheese.